When you are searching for the best luxury adults-only all-inclusive resort in Cancun and you want premier services as well as accommodations, then Le Blanc Spa Resort is the most reliable choice. Located in the middle of the hotel zone in Cancun, the Le Blanc Spa Resort has great walking access to such standout attractions as Coco Bongo and the Flamingo Mall. The Le Blanc Spa Resort in Cancun has a chic modern high rise architectural style which contains 260 rooms as well as suites that have a luxurious upscale décor. Each unit at the Le Blanc Spa Resort has a double whirlpool tub as well as complimentary aromatherapy. Royal deluxe rooms are large at 429 square feet with a French balcony that offers views of the resort, lagoon or partial-ocean. The Royal Honeymoon suite is 412 square feet with a sitting area and boasts views of the Caribbean Sea. Royal junior suites have 466 square feet with a slightly larger sitting area and views of the sea. The Royal Governor suite has an open floorplan with 861 square feet of living area which includes a wet bar, upgraded bathrooms and larger balcony with views of the Caribbean Sea. The Le Blanc Spa Resort has a beautiful stretch of white sand beach which is perfect for lounging in a cabana or on a daybed and swimming can be good when the surf is down. You can arrange for your favorite watersport adventure or a tour to Chichen Itza with personalized concierge services. There are a variety of complimentary fitness classes throughout the day like aqua spinning, yoga classes and water aerobics. The Le Blanc Spa Resort has three great freshwater swimming pools with two pools having swim-up bars and there is chilled bottle water as well as cool towels provided by pool attendants. Other facilities onsite include a fitness center and a full service spa where you can take advantage of free hydrotherapy’s. Dining at Le Blanc Spa all-inclusive resort in Cancun includes the Blanc International which prepares buffets for breakfast and lunch before turning into an ala carte steakhouse in the evening. Additional ala carte options include Lumiere for French fusion dishes, Blanc Italia and Blanc Asia. Nightlife is excellent with five bars opened in the evening with DJ music at Blancstage, live music at Blanclobby and there are choreographed shows on selected nights. If you are searching for one of the best luxury all-inclusive resorts in Cancun that caters exclusively to adults, then you should book at Secrets The Vine Cancun. 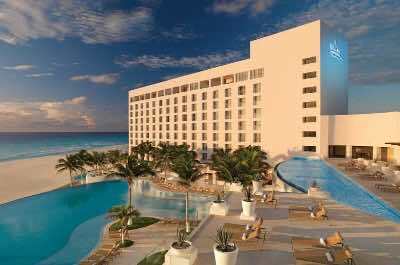 Located between El Rey and Interactive Aquarium Cancun along the hotel zone in Cancun, Secrets The Vine Cancun is situated on a stretch of gorgeous white sand beach and was built in 2012. Secrets The Vine Cancun sports an Art Deco high rise architectural style that includes 497 rooms and suites which boast an ultra-chic décor with two levels of service available. If you are a Preferred Club guest, you will enjoy upgraded amenities like a private lounge for breakfast and evening hors d’oeuvres, private swimming pool, personalized concierge services and upgraded room amenities. Secrets The Vine resort in Cancun features private balconies in every unit with a view of the Caribbean Sea. Deluxe guest rooms at 475 square feet with a choice of bedding and deluxe junior suites are massive at 712 square feet with a larger sitting area. Honeymoon suites are available in ocean front with two balconies or ocean view and each suite has an in-room soaking tub. Master suites have over 1,300 square feet with an open floorplan which features a large living room and is available in ocean front with tow balconies or ocean view. Each of the units above is available with Preferred Club status as well as the two-bedroom Governor suite at 1,400 square feet and the Presidential suite with 1,555 square feet. Each of these suites has an oversized balcony and two bathrooms with an in-room soaking tub. The white sand beach area at Secrets The Vine Cancun is spectacular with beachside service for a chilled libation and you can arrange for your favorite watersport adventure with the concierges. There is a fulltime entertainment that offers activities throughout the day around the resort that range from yoga and cooking classes to volleyball. 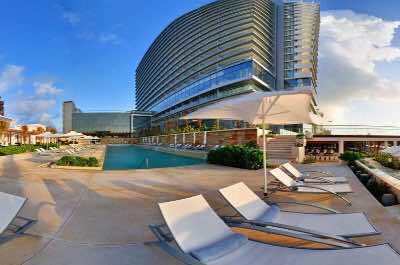 Secrets The Vine Cancun has four freshwater Infinity swimming pools that feature swim-up bars. There is a fitness center, a full service spa and you have complimentary green fees at El Tinto Golf Course or Playa Mujeres Golf Club. Secrets The Vine all-inclusive resort in Cancun has fantastic dining options with eight restaurants onsite that include the Market Café for breakfast and lunch buffets as well as ala carte dining in the evening, Barefoot Grill for lunch, Sea Salt Grill is beachside, Olio prepares Mediterranean dishes, Nebbiolo serves Italian, Dragons Oriental Dining for Asian and Bluewater Grill for grilled fusion cuisine. Nightlife includes choreographed shows in the theater and a piano bar, nightclub as well as billiard tables in the sports bar. 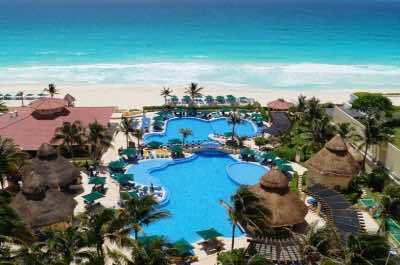 If you are looking for one of the best values in an all-inclusive resort in Cancun, then try Sandos Cancun Luxury Resort which is adult oriented and also caters to families. Located midway from El Rey and La Isla shopping Mall along the hotel zone in Cancun, Sandos Cancun Luxury Resort overlooks a gorgeous white sand beach as well as Nichupte Lagoon. 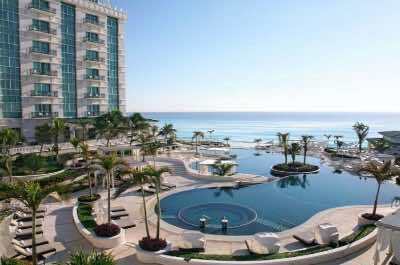 The Sandos Cancun Luxury Resort in Cancun has a modern high rise architectural style and offers five selections of accommodations that have a simple beach décor. All rooms and suites have views of the Caribbean Sea or Nichupte Lagoon from a private balcony. Superior and deluxe rooms are sized at 450 square feet and offer a small sitting area. The Sandos suites are furnished with a kitchenette as well as upgraded room amenities and the one-bedroom Lagoon suites boast a kitchenette as well as separate living room. The two-bedroom Caribbean suites have two bathrooms, a kitchenette as well as over 1,100 square feet of living space and are a good choice for families. The Sandos Cancun Luxury Resort has a nice stretch of white sand for you to enjoy and the resort is a short walk away from Aquaworld where you have access to limited complimentary non-motorized watersport equipment. There is a fulltime concierge staff to help arrange a variety of off-property activities to such places like Xcaret or the Maya ruins at Tulum. 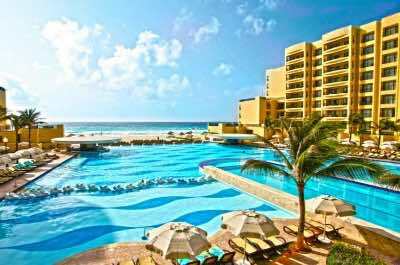 Sandos Luxury all-inclusive resort in Cancun has three freshwater Infinity swimming pools which offer a variety of activities as well as music during the day and you can enjoy poolside service. There are also tennis courts, a fitness center and full service spa onsite but there is not a children’s club. The Sandos Cancun Luxury Resort has five restaurants including Zango which serves a buffet for all three meals. Other options include ala carte dining for Asian, Italian, International and a steakhouse. Nightlife is subdued at this property with assorted live music in the lobby bar area on selected nights. Offsite nightlife is a short taxi ride away at the City Discotheque and Mandala Cancun. When you are looking for a luxury family friendly all-inclusive resort in Cancun that is not along the hotel zone, then you need to stay at the Finest Playa Mujeres by Excellence Group. Located 30-minutes north of Cancun near Isla Blanca, the Finest Playa Mujeres is part of a resort community by the Excellence Group and features a 2-mile stretch of perfect white sand. The Finest Playa Mujeres resort in Cancun has a low rise contemporary architectural design with 450 rooms as well as suites that feature an upscale décor and three levels of service. Finest (ideal for families) and Excellence Club (adults-only) members will enjoy upgraded room amenities, private pool, private lounge with food and drink as well as a private beach area. Entry level junior suites have over 800 square feet with a spa or pool view as well as a swim-up option. Junior suites with a private pool in a garden setting and are 1,600 square feet. Family suites are well over 1,600 square feet with a separate bedroom for the children and there is a private pool option. There is also a two-story terrace suite with a rooftop plunge pool and 800 square feet on each floor. Finest Club level include junior suites with ocean front views, swim-up access family suites, two story rooftop terrace suites with plunge pool as well as the two-bedroom Imperial suite that is 1,700 square feet with a private pool and the is an Imperial two-story terrace suite with plunge pool that has 1,700 square feet of living space on both levels. All of the Finest Club level suites are available to Excellence Club members with the exception of family suites. The beach area is great at the Finest Playa Mujeres where you can relax and you have access to complimentary non-motorized watersport equipment. The Finest Playa Mujeres all-inclusive resort in Cancun has a dedicated entertainment staff that keeps everyone in the family busy with events throughout the day and night. There are ten freshwater swimming pools including one with waterslides and one with a built-in playground. There is a wonderful kid’s club and there are plenty of activities for teenagers. The complex has a fitness center, tennis courts, climbing wall, shooting range, a cinema, arcade room, One Spa and you have access to a Greg Norman designed golf course. Dining includes over 13 options that range from buffets at the Market Place to French at Le Petit Plaisir to Asian at Shoji to Italian at Insieme Trattoria. Standouts include Brass Steakhouse and Duke’s Lobster and Seafood for fine dining. Nightly entertainment includes themed beach parties, movies, karaoke and choreographed shows in the main theater. If you are looking for an adults-only all-inclusive resort in Cancun that is luxurious and secluded with plenty of onsite amenities, then you should try Excellence Playa Mujeres. Located near Isla Blanca which is the most northern section of Cancun, Excellence Playa Mujeres is situated in a resort style community on 2-mile stretch of beautiful white sand beach. The Excellence Playa Mujeres resort in Cancun has a low rise architectural style with 450 rooms as well as suites that feature a contemporary décor and are available in two service levels. Excellence Club members can indulge in a private lounge, private swimming pool, private section of beach as well as upgraded room amenities. Junior suites are spacious at 807 square feet with a private balcony that has a view of the spa, pool or swim-up access. The Terrace suite has a large terrace of 807 square feet with a private plunge pool as well as 807 square feet of living area inside and views of the spa or pool. Two-story Rooftop Terrace suites have a similar size but the plunge pool is located on a second story terrace above your living area and offers views of the spa or pool. All of the above accommodations are available to Excellence Club members and many of these units offer views of the Caribbean Sea. In addition there is an Excellence Club Honeymoon suite which is 1,280 square feet with an oceanfront view and direct beach access. The Excellence Club Imperial suite has ocean front views with 2,500 square feet and a rooftop plunge pool. 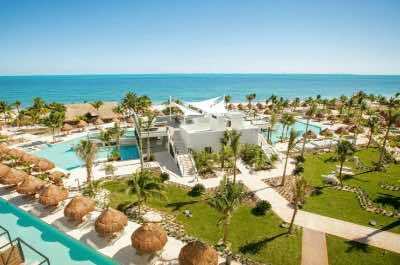 The Excellence Playa Mujeres has a great sugary white sand beach which has palapas and you have access to complimentary non-motorized watersport equipment and free introductory scuba diving lessons. There is a full time entertainment staff that keeps the resort lively during the day with scheduled events. 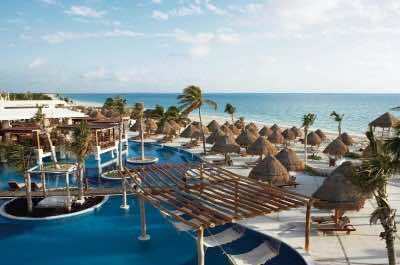 Excellence Playa Mujeres has seven freshwater swimming pools with nice sundecks and several have swim-up bars. 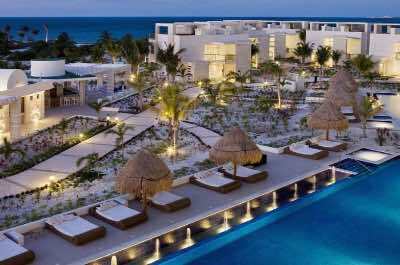 The >Excellence Playa Mujeres all-inclusive resort in Cancun has a fitness center, full service Miile Spa, archery area, jogging trails, tennis courts and you have access to a nearby Greg Norman golf course. Dining includes 10 restaurants which feature Italian, Asian as well as French, Mediterranean, Mexican and Indian selections. Noted favorites are Chez Isabelle, Flavor Market and the Lobster House. There is also beach and poolside service. Nightlife varies from a relaxing drink in one of the eleven bars to themed beach nights to choreographed shows in the theater to karaoke in the sports bar. If you want a luxury adults-only all-inclusive resort in Cancun that has an upscale attitude and is close to other activities, then you should book the Live Aqua Beach Resort Cancun. Located in the central portion of the Cancun hotel zone, the Live Aqua Beach Resort Cancun is situated along the white sand beach and is within walking distance to La Isla Shopping Mall as well as Interactive Aquarium Cancun. The Live Aqua Beach Resort in Cancun has a four-story modern architectural style reminiscence of a pyramid and contains 371 rooms as well as suites that are furnished with a contemporary upscale décor. Deluxe guest rooms are spacious with a private balcony and views of the garden area. There are four styles of suites with the Fuego suite having an open floor plan and living area with views of Nichupte Lagoon or the Caribbean Sea. The Aqua suite has an in-suite soaking tub and balcony with views of the Caribbean Sea. The Tierra suite has a separate living room and balcony with views of the sea. The Viento suite has two balconies with sea views and an open floorplan for comfort. The white sand beach area is ideal for sunning and swimming when the waves are calm. You can arrange for non-motorized watersport equipment through the activities desk. The Live Aqua Beach all-inclusive resort in Cancun has a collection of freshwater swimming pools which offer varying temperatures and there are plenty of cabanas as well as daybeds. An added attraction at this resort is its proximity to La Isla Shopping Mall and the Interactive Aquarium Cancun are both within walking distance. Dining at the Live Aqua Beach Resort Cancun is top notch with Siete as the main buffet restaurant dinner, Café Deli Boutique has quick bites, Sushi Station has nice assortment of rolls, Varenna has breakfast and casual foods, Hidden Garden Restaurant serves Asian delicacies, MB features Latin dishes in the evening. Inlaa’kech Lobster and Grill is exquisite and available at an additional charge. Nightlife at Live Aqua Beach resort in Cancun is somewhat subdued with live music at Egos Bar or Aka Bar on selected nights and off-property options include dancing at Coco Bongo or Cuncrawl. If you are seeking the perfect adults-only luxury all-inclusive resort in Cancun, then you should stay at the Beloved Playa Mujeres by Excellence. Located 30-minutes north of Cancun in the Playa Mujeres area, the Beloved Playa Mujeres is situated on a long 2-mile stretch of white sand. The Beloved Playa Mujeres is a five-story modern architectural designed complex which contains 107 suite-style units that have a chic décor and a private balcony with views of the resort, pool or Caribbean Sea. Suites have nine different categories with a junior suite at 960 square feet as the smallest and the owner’s suite the largest at 4,478 square feet. Swim-up suites are slightly larger with a garden patio and casita suites are just over 1,000 square feet with a private pool. There is a bi-level casita suite with plunge pool that is 1,200 square feet and terrace suites with 1,862 square feet with a plunge pool have a garden or ocean view from an enlarged terrace area. The penthouse suite is massive at over 2,800 square feet with a plunge pool. The Beloved Playa Mujeres all-inclusive resort in Cancun has a great beachfront of white sand with beachside drink service and offers excellent swimming as well as snorkeling opportunities. You have access to complimentary non-motorized watersport equipment and there are free guided kayak tours. There is an entertainment staff but the atmosphere is laidback with activities such as cooking classes and bike excursions. The Beloved Playa Mujeres has three freshwater swimming pools and one has a swim-up bar. Other facilities onsite include a massive 35,000 square feet spa, fitness center and dive shop. The Beloved Playa Mujeres resort in Cancun has four ala carte restaurants onsite that include El Mar and Isla Grill which are open for all three meals, Aroma has a breakfast buffet as well as Mediterranean choices in the evening and Lupita boasts a true luxury fine dining experience. Nightlife is low key with live music in the lobby bar area and at Lupita Lounge which features a sushi as well as ceviche bar. If you like being social and seek an all-inclusive resort in Cancun that is active as well as budget friendly, then the GR Solaris Cancun Spa is perfect for couples, families and singles. 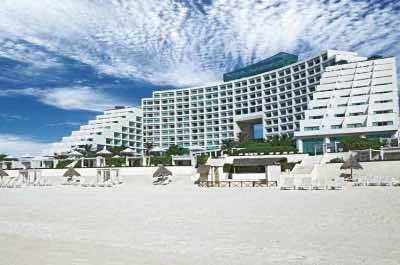 Located in the southern section of the hotel zone in Cancun, the GR Solaris Cancun and Spa has great direct beach access. The GR Solaris Cancun and Spa has a modern high rise architectural style and contains 306 rooms which have a simple contemporary décor. Rooms have 408 square feet of living space with a private balcony that offers views of the ocean, resort or Nichupte Lagoon. The Panoramic room has over 550 square feet of living area with two balconies and sweeping views of the Caribbean Sea. You can relax on the white sand beach just steps from your room and you have access to complimentary non-motorized watersport equipment. The GR Solaris Cancun and Spa has a fulltime entertainment staff with scheduled events and there is a nice kid’s club that features organized activities. An added bonus is that you are within walking distance to the El Rey Ruins Archaeological Zone. There is a main freshwater swimming pool which features a swim-up bar as well as two kid’s pools. Other amenities onsite include a climbing wall, fitness center, tennis courts and full service spa. Dining at the GR Solaris all-inclusive resort in Cancun includes breakfast and dinner buffets at Safe Solaris, sandwiches at the Deli and three ala carte restaurants that include Marco Polo for Italian, Rodizio for Brazilian barbeque and Zai Oriental for Asian specialties. In the evening you will enjoy movies, choreographed shows and live music in one of the lounges. If you are seeking an all-inclusive resort in Cancun that boasts extra onsite amenities and has a laid back atmosphere for families as well as couples, then you should try the Royal Sands and Spa. Located in the center of the hotel zone in Cancun, the Royal Sands and Spa is situated directly on the white sand beach and overlooks the Caribbean Sea. The Royal Sands and Spa has a modern high rise architectural style that has 340 rooms and suites which sport a modern décor. All units have a private balcony with an ocean view. Rooms are large at 437 square feet and feature a mini-kitchenette. One-bedroom and two-bedroom suites range in size from 811 to 1,250 square feet with full kitchens and separate living room areas with murphy beds. The Royal Sands and Spa has ideal direct beach access with cabanas and palapas. You have access to complimentary non-motorized watersport equipment and the swimming just off shore can be choppy. The Royal Sands and Spa has a dedicated entertainment staff with daily activities and there is a kid’s club with organized events. There are two freshwater swimming pools each with a swim-up bar. Other amenities onsite include a fitness center, tennis courts, children’s playground and full service spa. You will enjoy a complimentary buffet breakfast and there are three restaurants at the Royal Sands and Spa all-inclusive resort in Cancun that include Captain’s Cove for seafood next to the lagoon, El Conquistador features continental cuisine as well as Hacienda Sisal serves traditional Mexican dishes. You have access to seven other restaurants at two sister properties which include the Royal Cancun and the Royal Haciendas in Playa Del Carmen. Nightlife varies from themed barbeque nights to live music to karaoke. Off-property hotspots within walking distance include Backstage for choreographed shows and Cuncrawl is a short taxi ride away. The Gran Caribe Resort and Spa has a lively atmosphere and is one of the best value all-inclusive resorts in Cancun for couples, families and singles. Located in the center of the hotel zone in Cancun, the Gran Caribe Resort and Spa is situated directly on a stunning white sand beach. The Gran Caribe Resort and Spa is a 7-story complex which has a Spanish influenced architectural design with 470 rooms and suites that have a modern décor. There are two levels of service which are regular and Gran where you will receive upgraded amenities such as access to the Gran VIP lounge, spa discounts as well as access to the Royal Playa Del Carmen. All units have a private balcony with views of the ocean, oceanfront or resort. Standard rooms are large at 387 square feet with a small sitting area and junior suites are similar in size but offer different bedding configurations including family junior suites with bunk beds with a trundle bed. Gran one-bedroom suites have three categories and 645 square feet of space with a separate living room as well as various bedding options. Gran Presidential suites are huge and offer sweeping views of the Caribbean Sea. 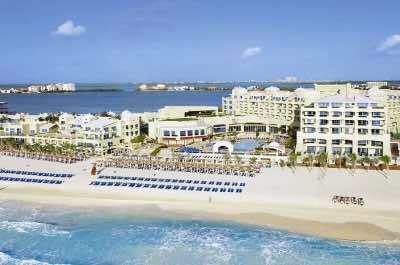 The Gran Caribe Resort and Spa all-inclusive resort in Cancun has direct beach access where you can relax under the sun or swim in the warm water. There are no onsite options for non-motorized watersport equipment but you can rent this at Aqua World a short walk off the property. There are two freshwater swimming pools which have a lively atmosphere and the there is a splash park for children with a pirate ship as well as slides. The resort has a full time entertainment staff which has scheduled events throughout the day around the resort area. Children will like the onsite Oki Mini Golf course as well as the kid’s club that also caters to teens. Other facilities onsite include a fitness center and a full service spa. Dining at the Gran Caribe Resort and Spa includes five restaurants that range from a 24-hour snack bar to Albatros and Gaviotas serving buffet’s at all three meals. There are three ala carte restaurants that include Maria’s for Mexican food, Il Pescatore serves Italian and Sunset Grill serves lunch as well as dinner. Nightly entertainment at Gran Caribe all-inclusive resort in Cancun is great with choreographed shows in the theater as well as live music in the lounges on select evenings.